Over the coming months, 3PP will feature accounts from different individuals describing a formative or memorable art experience, which prompted them to seek information about a work's history and meaning, or the artist(s) behind it. This impulse to "find out more" is the essence of art historical thinking. It is hoped these accounts will demonstrate that seeking knowledge about an art work is a rewarding exercise anyone can participate in. The examples featured will not be limited to painting, but any form of visual artistic expression that is relevant to the writer, from architecture to video games. Unfortunately, my tweet did little to capture the excitement of the moment! At this point in time, the portrait was in a scuffed corner of a room featuring works by Raphael and Andrea del Sarto. I recall it was near a window, which on the day was partially ajar to allow in some air, showing a glimpse of the Arno river. The Raphael portrait in a scuffed, dingy corner in the Uffizi. Image from the first version of the Google Art Project. I noticed the small painting and recognised it immediately. As one normally does with familiar works, I was quickly drawn in for a closer look. I observed the panel for several minutes behind the glass, noticing the texture of the paint, the brushtrokes, the way the eyes, eyebrows and hair had been rendered - all to deliver the image of the famed artist, depicted as an unassuming youth calmly gazing out at the world. 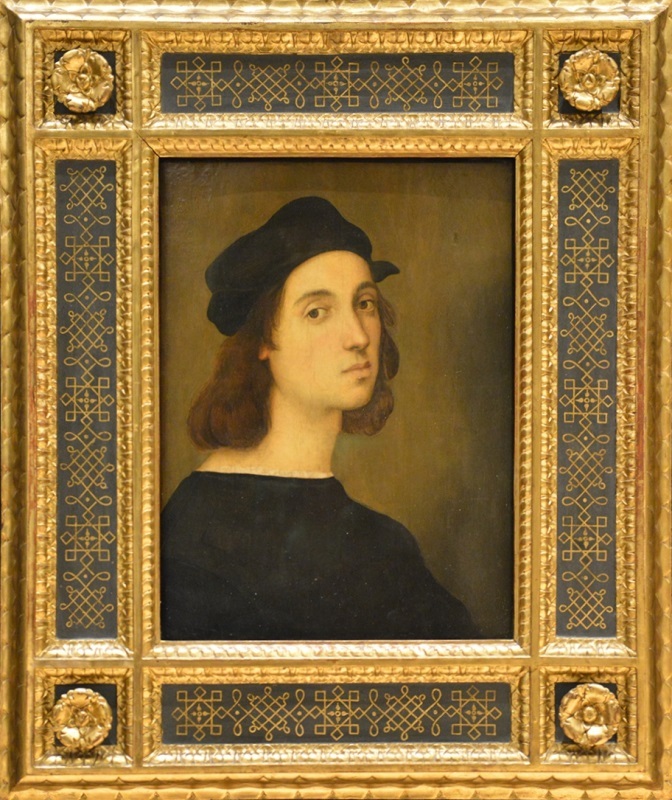 The first high quality image of Raphael's portrait in its frame was released online in March 2013 by the Polo Museale Fiorentino to promote this painting being featured in the Raphael exhibition in Tokyo. Upon returning home to Australia, a sense of familiarity with this image persisted. I continued to post at 3PP, mentioning Raphael intermittently but not yet seeking any detailed information on the Uffizi panel. It was only when a copy of the Uffizi self portrait was discussed in the news, that the experience began to have a more practical outcome. Originally reported in English by the Discovery News Network (link), an admittedly unusual looking copy of the Uffizi self portrait had attracted media attention after being published in the expensive collector's volume Raffaello Universale. Although this version has been discussed in scholarly literature since the 1930s, it has not met with any firm consensus as to its authenticity. To many it appears more an homage to Raphael, perhaps featuring the face of another artist rather than being another image of Raphael himself. The evidence reported for this piece shows no clear material or documentary link back to the 15/16th centuries. This prompted my thinking about the process by which artworks are dated and verified to actually be by the artist in question. I soon discovered that this process was somewhat controversial, described in art historical circles as "connoisseurship". Shortly after posting a report of this story (link), I was approached by a collector who claimed he had a copy of the Uffizi self portrait and sought to determine its age. I presently can not divulge any details of this case, but I can say this version did not appear in any of the vast literature on the Uffizi version and its copies. My role in this was to summarise the existing documentation and history of the Uffizi piece. This experience highlighted the complexity of accurately describing the authorship of a painting. 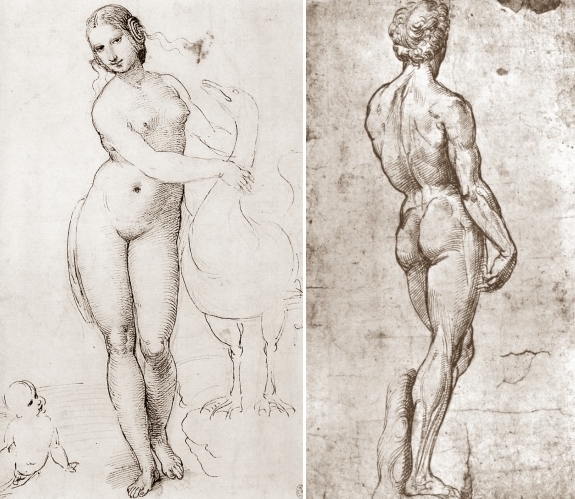 The confidence inspired by this process made me eager to examine more works by Raphael in a structured manner. I began to acquire catalogs, books and articles dedicated to the artist and in particular, attribution studies specifically. These volumes explored the nuances of how Renaissance workshop commissions were carried out, and the process by which modern art investigators determine attributions. A summary of the findings of these key publications were often published at 3PP as book reviews (see related links). During this (ongoing) learning process, I would gladly share what I had learned not only at 3PP but via the social media platform called twitter. I was pleased to notice that people were interested in finding out more about this artist and the range of his achievements. I soon discovered that my passion for the topic was beginning to encourage others to visit Raphael works. Many would write to me, some would even send pictures of Raphael (and related) works they encountered in their travels. Thanks to Gemma, Sedef, Agnes, Auriea and Ellie for these wonderful "brushes with Raphael" sent via twitter. I hope to receive many more over years to come. Leonor, a graduate student from Portugal also kindly gifted 3PP a video shot in May 2012 by her study group - depicting her visiting Portugal's only painted Raphael, a small predella (altarpiece adjunct panel) at the Museu Nacional De Arte Antiga in Lisbon. Thanks! It was also very exciting to visit Madrid in June 2012 for the Late Raphael exhibition and conference, where I was able to meet many of the world's top Raphael scholars in person. When sharing what I was learning about Raphael with others, I found posting images would always gain the most interest and responses. This would allow me to share things that were not commonly accessible online. 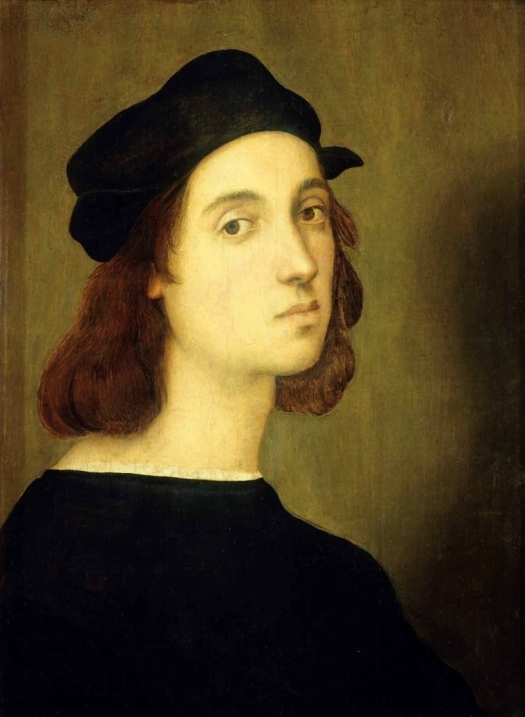 An example of an image which attracted great interest featured Raphael's signature, taken from a letter he wrote to his uncle, Simone Ciarla in 1508. Your Raphael - painter in Florence. This letter is now preserved at the Vatican. Raphael wrote this letter at age 25, near the end of his time in Florence. He would leave for Rome later in this year. 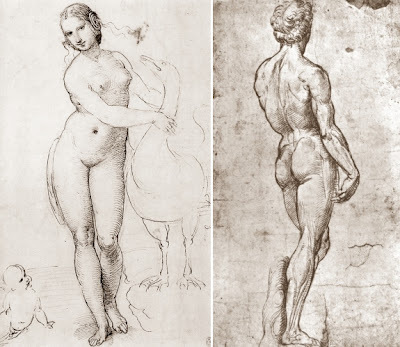 Being based in Florence (at least since 1504) had exposed him to the marvels of the Florentine artists, with the influences of Leonardo, Michelangelo and Fra Bartolomeo (among others) appearing in his drawing and use of colour. 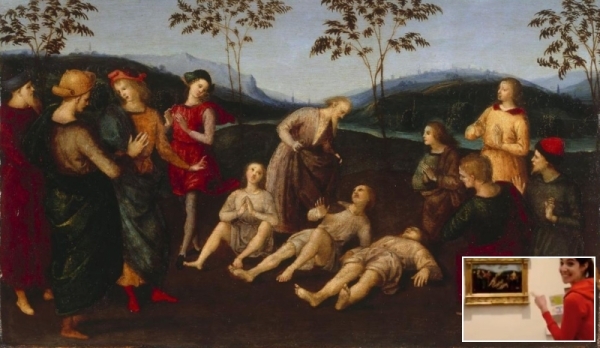 In fact, a closer look at Raphael literature indicates at least a dozen influences on his painting alone, ranging from Hans Memling to Sebastiano del Piombo. The rapid evolution in his style within a relatively short span of time was unprecedented among his contemporaries, forming a great part of the allure of Raphael studies. 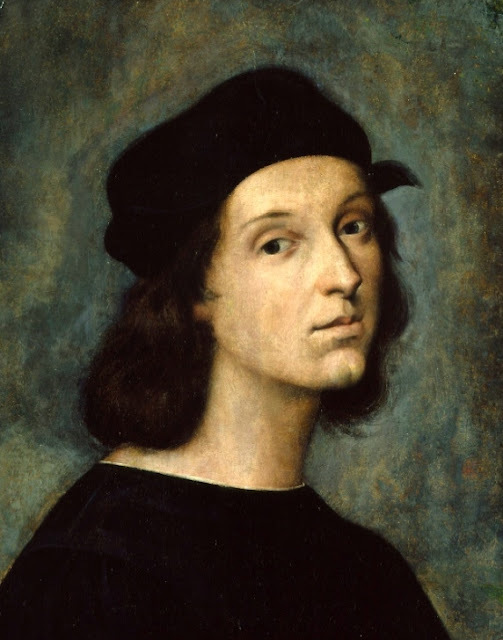 Raphael processed his art experiences through his work. Here he makes a direct sketch of Leonardo's Leda (now lost), and poses a model in the same posture as Michelangelo's David. My exploration of Raphael's career is admittedly in its very early stages. My present goal is to complete the Open Raphael Online resource, and continue to encourage others to take a closer look at the artist. I would like to thank all visitors to 3PP since November 2009 for their interest and great encouragement, with a special fond mention of 3PP's twitter followers for their wonderful images and shared experiences. This is really fascinating and enlightening. Previously (before 3Pipenet)I would have never thought that someone outside of academia would be qualified to do serious research on attribution. Well, you have proven repeatedly the fallacy of this misconception. Thanks, Hasan! I already knew some of the background to ORO but I am glad to see the whole story set out so clearly. Needless to say, if we knew each two years ago and you asked my advice (which, thank God, you didn't) I would probably have come back with something in the "where angels fear to tread" line. Anyway, you will be in Florence in a few days time and it will be interesting to hear how the portrait looks to you now. How divine! Thanks for this honest account Hasan - what a great idea! I eagerly await to read these stories from others as well, what is more beautiful than someone confessing their passion for art?! I have been following TPP since 2010 and do remember the older, more playful Raphael posts. As time progressed the detail just kept piling on and the writing became more crisp, focused and purposeful. Take your time with "Open Raphael" please... it is quite obviously your gift to the world. I will be most curious to read your impressions of Florence the second time around. Thanks for this post, Hasan -- this is the best of blogging, in my opinion -- personal observations and experiences mixed in with information, all about a topic that you're fascinated with. I look forward to reading more of these posts! Fascinating to learn how and why you've become so knowledgeable about Raphael. Looking forward to more brilliant articles on Open Raphael Online. I am very much interesting in knot patterns in the frame of his Portrait. Would you/anyone teach me historical story about it? who set this frame ? When, why? I know knot patterns were painted in cloth ornaments in some portraits. The pattern in the frame is related with them ?